What Makes a Good Science Communicator? I have been pondering this question for a long time and it is especially apposite now, when we are surrounded by science communicators of all levels of competence. The best and most effective one I ever encountered in my discipline was Sidnie Milana Manton FRS (the photo was taken towards the end of her life). I met her in my first week in the Zoology Department at King’s College London in 1955. She was a tall, spare, distant woman with greying hair and steel-rimmed glasses, and a high-pitched raspy voice that tended to become querulous with rage. It was not until I was assigned to her tutorial group in second year that I overcame the sense of awe I felt towards her and began to appreciate the outstanding quality of her mind. She was an invertebrate biologist of great intellectual breadth. 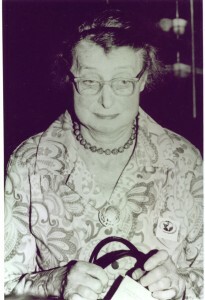 A major influence in her own career was a Royal Society expedition to the Barrier Reef in the 1920s. The collections she made then filled half the College museum and a good proportion of the London Natural History one as well. The less important material was trotted out for undergraduates to mishandle. In our final exam we had to dissect sea hares that she had collected on the Reef, more than thirty years previously. Most of their innards were, by then, liquid but she made no concessions. She remarked, of the finished work of one student, that it looked as if he had done it with his teeth.